Heard about the Detroit radio station had a contest called “New Year, New Rear” and gave the winner $15,000 worth of liposuction? 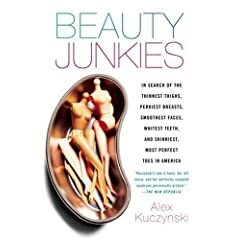 You would have if you’d read Beauty Junkies: In Search of the Thinnest Thighs, Perkiest Breasts, Smoothest Faces, Whitest Teeth, and Skinniest, Most Perfect Toes in America, (Broadway, 304 pp., $14.94, paperback), just out in paperback with a new subtitle (replacing Inside Our $15 Billion Obsession With Cosmetic Surgery). How did we get to the point that some people don’t blink when they hear about a “New Year, New Rear” promotion? What are the social, emotional and medical costs of the cosmetic surgery boom? New York Times reporter Alex Kuczynski www.alexkuczynski.com gives fearless answers in a skillful blend of reporting, social commentary and advice to people who may submit to the knife or needle. Ishmael Beah Says He Was Shot ‘Three Times on My Left Foot’ But Suffered No Serious Damage — Can Any Soldiers, E.R. Doctors or Others Explain This? On this site I try to keep reviews short enough that you can read them in a minute if you skip the supplemental material at the end, so I’ll often give one example instead of three or choose a brief quote from a book instead of a long one. But enough questions have been raised about the credibility of Ishmael Beah’s A Long Way Gone that I’d like to mention a scene from it that didn’t appear in my original review. In this scene Beah talks about continuing to fight after receiving “many bullet wounds” and about foot injuries don’t appear to have left him with a limp or a need to use a cane. Beah’s account of his injuries seemed implausible, but I don’t have a medical or military background. Would anyone with expertise in such fields like to comment on the following? Ishmael Beah says in A Long Way Gone that he received “many bullet wounds” in a firefight in Sierra Leone but kept attacking a village his squad was trying to take. He adds that after 24 hours, he and his fellow soldiers seemed to have achieved their aim. Then they were attacked again, and he was hit three times in the left foot: “The first two bullets went in and out, and the last one stayed inside my foot.” The third bullet, he says, was later removed with “crooked-looking scissors” by a “sergeant doctor” in the Sierra Leone army at a base camp. After leaving the army, Beah entered a hospital and was told that medical tests showed that nothing was “seriously wrong” and he would just have to take medications until his next checkup. Quotes from pages 156–158 and 163. Links: The original review of A Long Way Gone appeared on this site on Feb. 27, 2007. www.oneminutebookreviews.wordpress.com/2007/02/27/. A reading group guide was posted on March 5, 2007 www.oneminutebookreviews.wordpress.com/2007/03/05/.